I love ringing in a new year! It is always filled with new opportunities and new beginnings! Like for example, I am starting a new sewing blog and community resource with Katie of the Creative Counselor called Sew Altered Style (click the link to learn more about it!). I am ALSO hosting my first sewalong for Sly Fox Fabrics where I will be showing everyone how to sew the Love Notions La Bella Donna. Honestly, I would be lying to you if I said I wasn’t at least a LITTLE bit nervous – I’ve made the pattern a handful of times so far (with two previous versions blogged here) – but the idea of making it in front of others is admittedly a bit daunting. What if I mess up? What if you all hate my voice? What if my kids walk in while I’m filming? What if, what if, what if???…. Anxiety aside, this is hopefully going to be a fun experience for me and any of you who join along! If you’ve made 100 of them already – now’s the time to make number 101! If you’ve never had the pleasure of sewing up this pattern – now is the time to give it a try! Even though it’ll be hosted in the Sly Fox Fabrics Sewalong group (click the link to join the group) – you don’t have to use Sly Fox fabric to do so (though of course that would be nice 😊). What is the La Bella Donna Anyway? The La Bella Donna* is a dolman sleeved top (yay for no set in sleeves!) with options for a boat neckline, cowl or hood. You can also add pockets and make it in tunic length (yay for no pants – well I mean, I don’t know where leggings fall for y’all, but for me I’m calling them not pants – even though I love them). I made mine up in a gorgeous amber brushed hacci and floral sweater knit – and love that it’s JUST enough floral to be pretty – but not overwhelming (which happens easily to me when I attempt to wear florals). Why should you bother joining the sewalong? 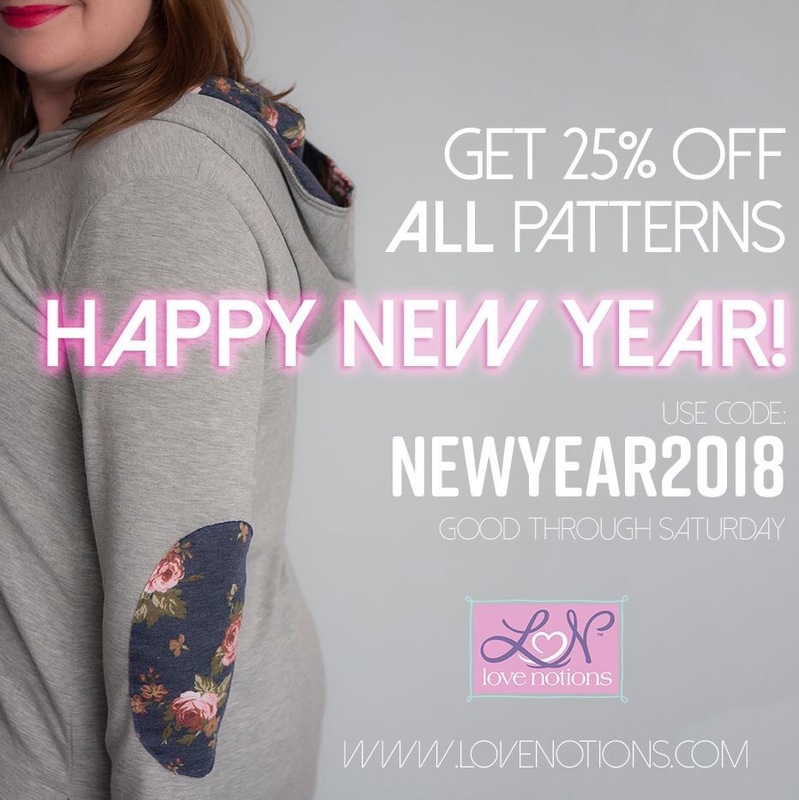 And in case you wanted to rack up on some other Love Notions patterns in the meantime, the Love Notions team is kicking off the New Year with a bang — 25% off of patterns through Saturday! In all – suffice it to say – I am scared, stoked, and ready for new challenges in 2018! Here’s to wishing us all a fantastic new year!! May our bobbins be ever full, and our stash overflowing with gorgeous inspirations. What are your plans for the new year?? Any resolutions? *This post contains affiliate links. If you click the link and make a purchase, I receive a very modest compensation that immediately goes towards more fabric and pattern purchases – and ultimately more blog posts! Looks like fun! Don’t be nervous about the kids walking in… the cnn commentator survived his kids and wife barging in on his segment 😉! Oops bbc commentator not cnn! Just saw it on a 2017 recap. I love your blog. Beautiful work. Wow – thank you Carolyn! !